Lee E. Koppelman and Seth Forman. 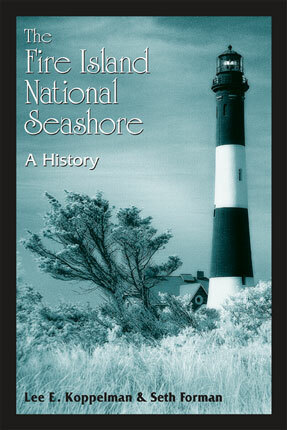 The Fire Island National Seashore: a History. Albany, NY: State University of New York Press, 2008. Pp. 208. Photographs, notes, bibliography, index. ISBN: 0791473422. $21.95. In 1839, Benjamin Thompson, Long Island’s eminent historian and natural scientist, believed that Long Island was created from the sea. We now know differently. We also know that Fire Island was most likely formed and maintained by erosional processes and littoral drift, and sand transport from offshore. Fire Island is a barrier island that creates the lagoonal system that has provided some of the outstanding shellfishery resources along the US east coast; it buffers the Long Island mainland from the sea, and affords many recreational opportunities. It is an essential morphological feature. It was designated in 1964 as one of only five national seashores managed by the National Park Service. Other seashores of the elite five include Cape Cod, MA; Cape Hatteras, NC; Padre Island, TX; and Point Reyes, CA. Lee Koppelman and Seth Foreman relate a detailed history of the Fire Island National Seashore (FINS). It is particularly appropriate that Dr. Koppelman undertook this effort because as Director of the Long Island Regional Planning Board for decades he was close to many decisions that were made about FINS. Fire Island residents, social scientists, and those concerned with management of coastal environments should read this book. The authors elucidate the complex issues that arise where people and nature intersect in a coastal setting. They give a brief summary of the island’s colorful and somewhat mysterious history. They explain that the exact geological processes of its formation aren’t certain and the origins of its name are unclear. Permanent habitation dates back only to the mid-nineteenth century but the island was part of our whaling history, involved in piracy, the slave trade, and rumrunning. The authors also tell of the evolution of the Fire Island communities such as Point O’Woods and Fire Island Pines. As with any barrier island system, Fire Island is in a constant state of flux. This is at the root of the debate over its management and the authors discuss the erosional processes at work. They describe several of the major storms that impacted the island including the Hurricane of 1938 (The Long Island Express), which the authors call the “defining event in the creation of the Fire Island National Seashore.” There are many clear, crisp photographs of the damage to the island from both that storm and the March 1962 nor’easter. The authors provide a history of the development of the National Park Service including its sometimes competing missions of managing “natural,” “historical,” and “recreational” resources. They explain some of the complex pre-Park Service land uses facing NPS when it was given the mission of creating a national seashore on Fire Island. The first land set aside on Fire Island eventually became Robert Moses State Park. New York State did this out of necessity, supporting the need for a quarantine area during a cholera outbreak in the 1890s. At the opposite east end of Fire Island, Suffolk County created Smith Point Park. There were town beaches on the island as well as the federal land designated for the Fire Island Lighthouse. Erosion and erosion control are the most controversial issues confronting National Park Service management. Koppelman and Forman fairly discuss the varying points of view. Robert Moses had proposed constructing a roadway along the dunes, which he touted as a means of stabilizing the island. They tell us that this proposal caused Moses’s hold over New York State to begin to unravel. Koppelman, who knew the “Master Builder,” is the right person to tell this part of Fire Island’s history. FINS management has and will continue to be difficult because of competing interests. The last and longest chapter is devoted to this debate. Many residents who were on the island prior to FINS wanted the Park Service to be “a babysitter and policeman for their own private interests, instead of [maintaining it as] a public park.” Controversy continues today, including the expanding deer population, mosquito control, and the never-ending debate about erosion. The latter will only intensify as climate change becomes more apparent and sea level rise begins to accelerate. Will the Park Service favor leaving the island to be shaped by natural beach processes or will they protect and armor it as its role of buffering the mainland of Long Island becomes a necessity? Koppelman and Forman help elucidate the difficult positions and decisions the National Park Service has going forward. The book has a very good time line of events and a listing of the NPS Directors of FINS—a nice tribute to their service. The book needs a good map. Actually, given the number of place names, several page-size maps would have been helpful.